Leave it to Kendall and Kylie Jenner to add designer to their resume. Normally I wouldn’t think twice to shop their line just because it wouldn’t be age approprate for me, but surprisingly I didn’t hesitate when I saw this black and white, bold striped, off the shoulder top. The flouncy silhouette and the long flowy sleeves make a major statement. I wore my skinny, legging jeans to counterbalance the proportion of the top and added an unexpected pair of white pumps to complete the ensemble. Thank you Theoni. These sleeves had me as soon as I saw them. Aren’t they fabulous? Thanks babe! Thanks Jennifer. 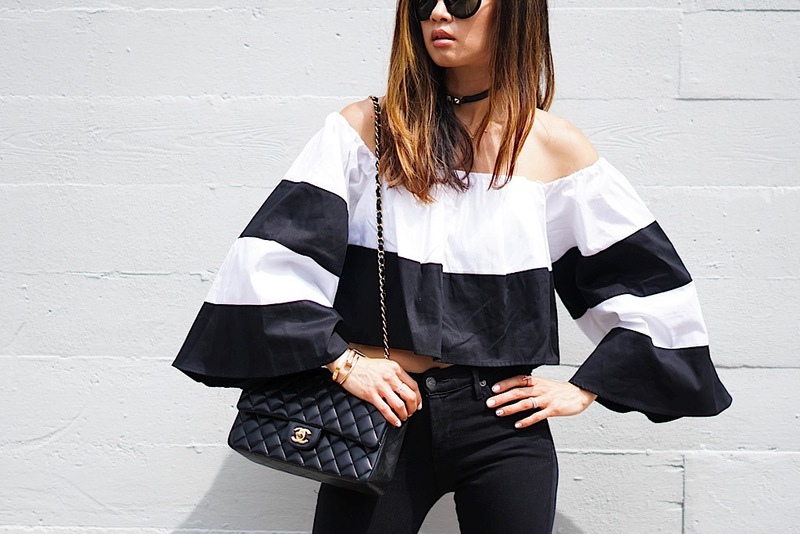 The sleeves on this top are everything!